Why you should go: Playing you chart-toppers as well as not-so-usual songs from the ’80s is the Mike Bon Gang. Known for welcoming jammers onstage, they also play songs by request (OPM, alternative, songs all the way back from the ’60s). Other details: Gig starts 10 p.m. Entrance is free! 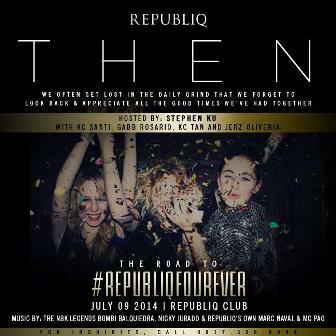 Why you should go: Missed the first leg of Road to #RepubliqFourever? Here’s your chance to catch its second installment when the club’s famed promoters and NBK legends take over the club scene. 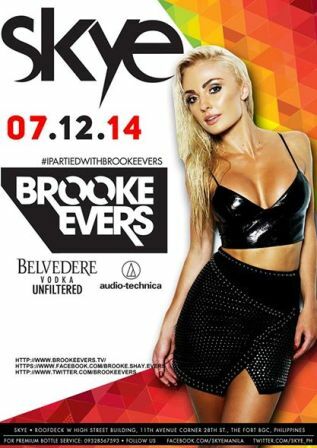 Other details: Party starts by 10 p.m. For table reservations, contact 09175508888. Why you should go: These two rock legends? 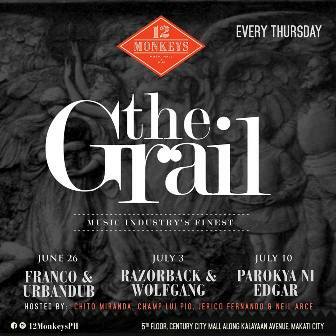 Yep, they're playing back-to-back in 12 Monkey's The Grail Thursdays, featuring the music industry's finest. Why you should go: Breakdancing showcase by J Masta + the soothing slick sounds of DJ Freshlee _ Boom bap head nod lyricism showcase by Duende + new duo Skarm & Rhxanders + the one and only DJ Supreme Fist and his exhibition of scratches and beats = one epic night! 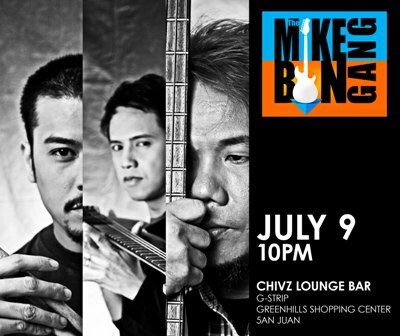 Other details: Gates open 9 p.m. Pay P200 for this live performance show. Why you should go: Can't wait till Disclosure plays here in Manila? 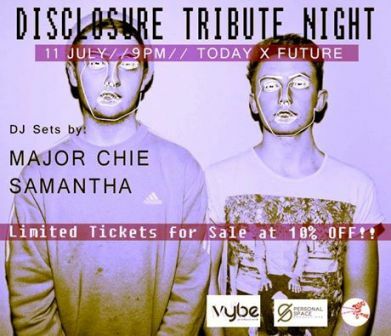 Why not practice jamming to their music in this tribute night featuring DJ sets by Samantha and Major Chie? If you still haven't bought your tickets, there will be limited VIP and Gold tickets for sale at 10% off at the event! Other details: Party starts 9 p.m. Contact 0928-520-9102 for reservations and inquiries. Why you should go: Synergy Sessions is back with a bang! Expect more fire and flow arts, more DJs and dancing, more drum beats and jams! Fire poi and other goodies will also be raffled off! Other details: Event starts 9 p.m. Get in for free! Other details: Party starts by 10 p.m. For reservations, contact 478-4284 or 0932-856-7593. 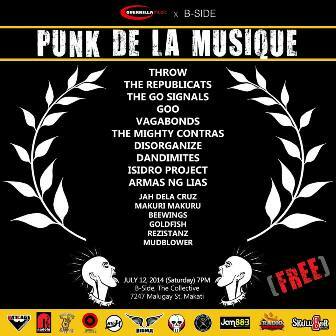 Why you should go: Get your punk on with Throw, The Republicats, The Go Signals, Goo, Vagabonds, The Mighty Contras, Disorganize, Dandimites, Isidro Project, Armas ng Lias, and other punk Pinoy bands! Other details: Doors open 7 p.m. No door charge! 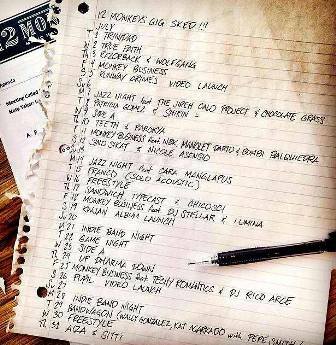 Why you should go: Check out all the awesome acts lined up for the month of July at 12 Monkeys. This Tuesday, Franco will be playing acoustic songs all night long! 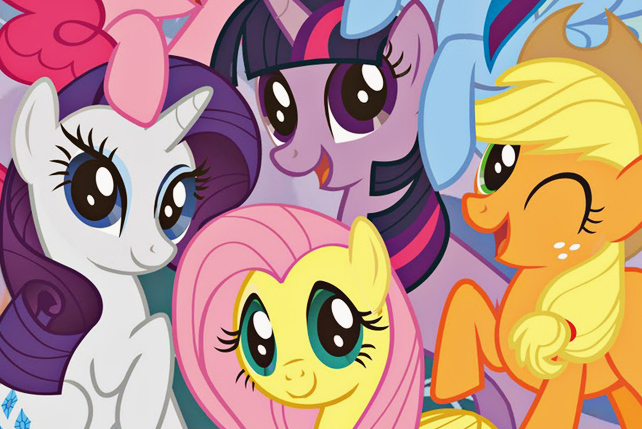 Why you should go: It’s Tuesday and you’re already bummed out? 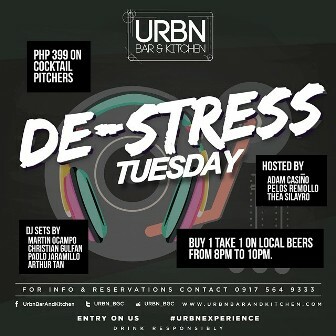 De-stress at URBN with P399 cocktail pitchers and buy-one-take-one local beers from 8 p.m. to 10 p.m. 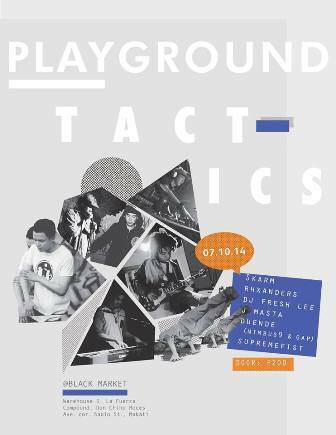 There will also be DJ sets by Martin Ocampo, Christian Gulfan, Paolo Jaramillo and Arthur Tan. Other details: Doors open 8 p.m. For inquiries and reservations, contact 0917-564-9333.